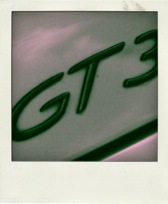 Welcome to 'the Porsche GT3 Resource' website. We thought it would be a great idea to bring together all of the GT3 technical data, reviews, road tests and any other material we could find into a central repository. This will allow GT3 owners and drivers to get easy access to as much information as possible to increase their enjoyment of this jewel in the Porsche crown. Chris - Entrepreneur & Principal Researcher. The official Porsche Cars North America press release and specification details can be found here. 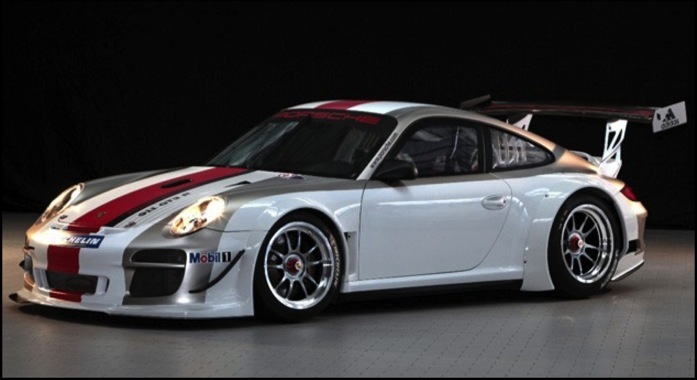 The latest (997-based) GT3 Cup Car has been released (above). It looks fantastic, and drives better than the previous model on the limit according to the factory drivers. Probably couldn't pick the difference myself, but would love the chance to try! 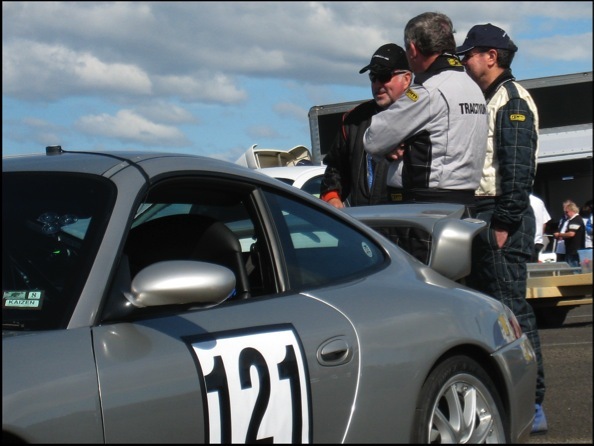 On behalf of the founders of 'the GT3resource.com', it is my pleasure to wish all our visitors and GT3 drivers everywhere, a safe, happy and healthy 2013. Enjoy the drive! 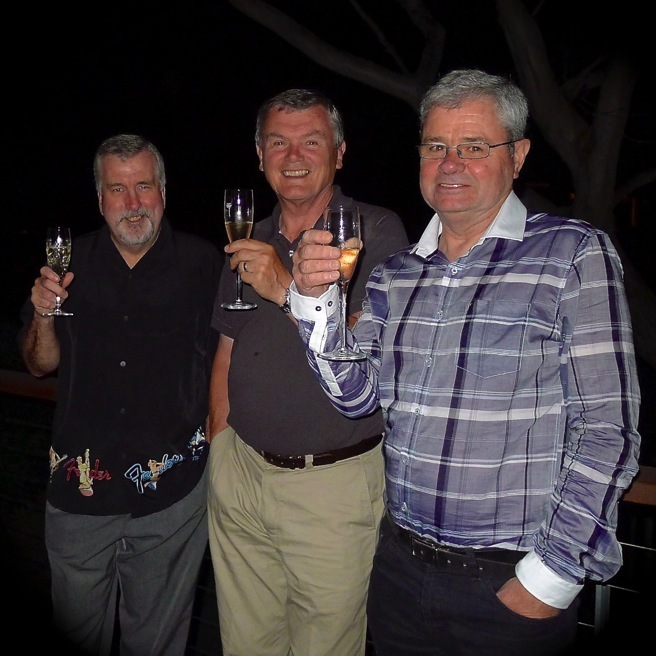 Well, another year is coming to a close and I would like to wish all GT3 owners and drivers in general, and TheGT3Resource.com visitors in particular, a joyous festive season and very best wishes for a happy, healthy and prosperous 2013. Safe driving everyone. 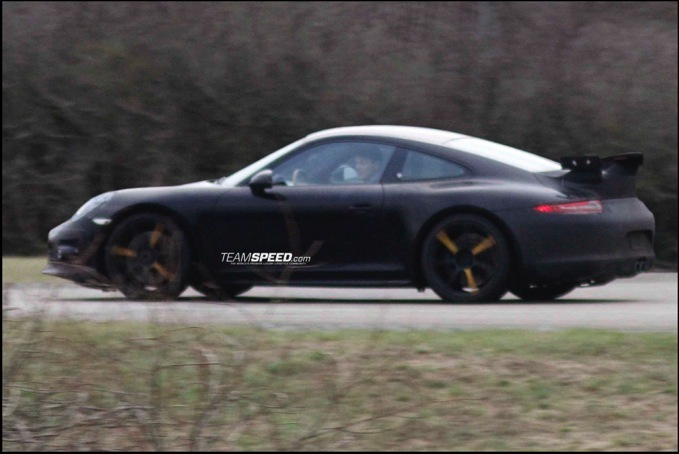 A new 991 GT3 video surfaced today (30/8) with the sound of a PDK transmission clearly evident. Mmmmm. 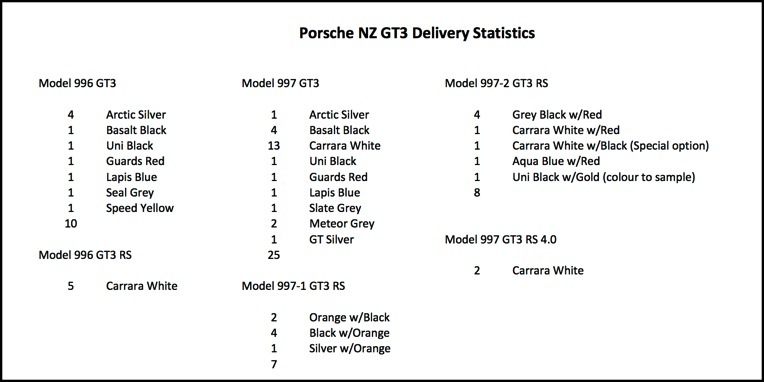 Following a request from a reader, I am pleased to publish the New Zealand GT3 delivery statistics, courtesy of the good people at European Motors Limited, the official NZ importers for Porsche. Thanks Greg! The 991 GT3 rumour articles have been moved for easy consolidated viewing. Click on the image above. I have also moved the GT3 RS 4.0 articles to here. Following on from the item below, an ex-pat NZ-er now in Singapore was interested in New Zealand GT3 delivery stats. Stay tuned, the 997 GT3 & RS data will be available shortly. 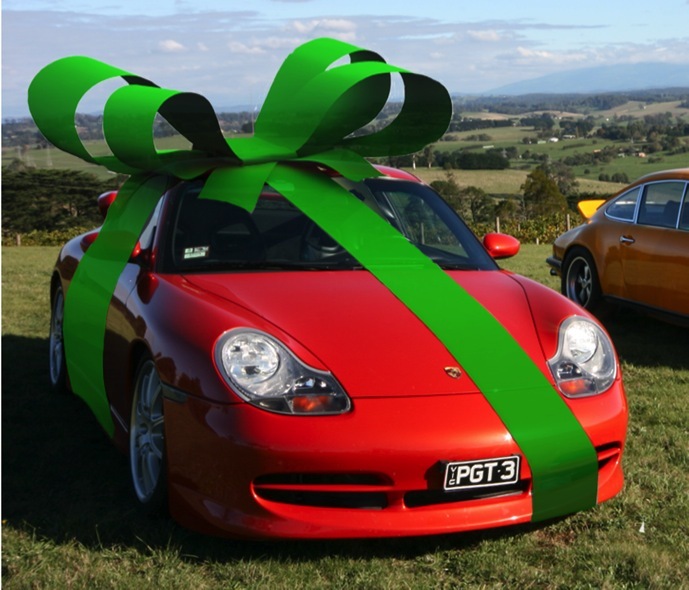 A friend requested I include the Australian delivery statistics & colours of 997 series GT3, both Gen 1 and 2. Enjoy! BTW, those who may be interested in the 996 Series, we had previously posted those statistics here. I have found some interesting motorsport releases and reviews to keep us all interested. Plus a couple of new videos have been added here. Porsche has just announced a new 2012 GT3 R race car. Click the picture below for further details. Those lucky Americans. For a lazy $10,000, and some competition license flashing, you can get an afternoon driving a factory supported / prepared GT3 Cup Car. No wonder the author was sweating before he even pressed the starter! A good read. 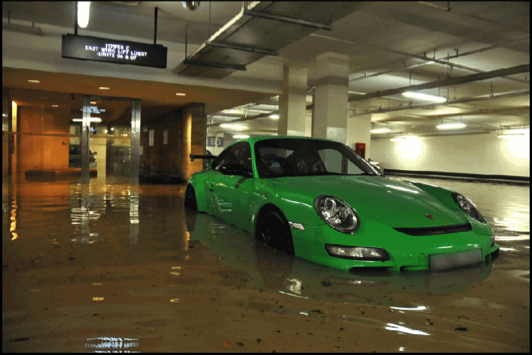 Recent heavy rains in Singapore have wreaked havoc on some basement garaged exotic machinery, including this poor 997 GT3 RS. I hope the owner had fitted the 'wets'! More details here. A new Autocar video of the 997 Gen 2 GT3 versus a BMW M3 GTS here. Another very positive 996 GT3 Buyers Guide, courtesy of EVO Magazine, has been added to our 'Links' page. 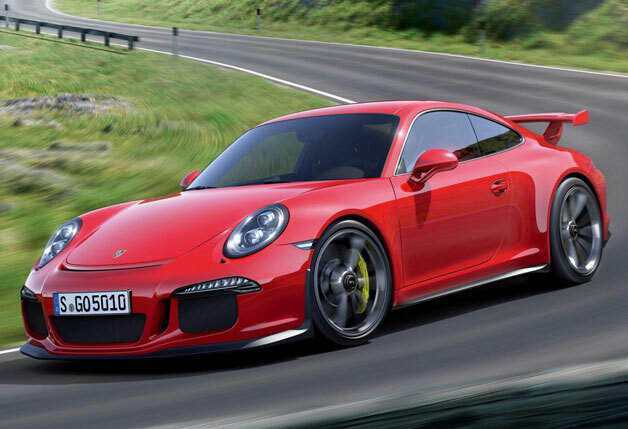 A great new rumour has surfaced about a faster 997-2 GT3 RS. Outstanding. A brief update here. 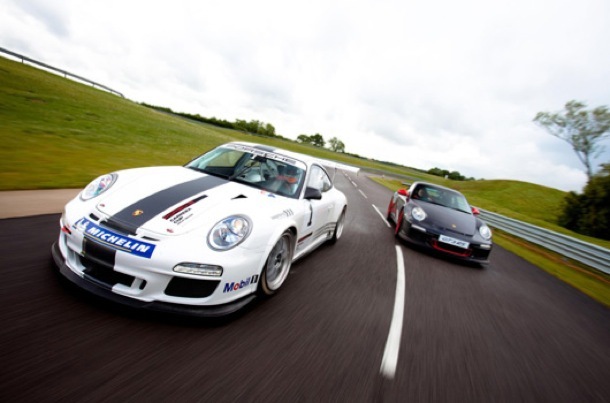 And a great video comparo of race & road GT3s from 'Road & Track' magazine. A good article about the upcoming Carrera Cup series in Australia in 2011, including some technical specifications of the cars. And finally, a quick video of your humble correspondent having a go at a recent track day practice session. One of our regular readers has suggested we put some time and effort into the highly technical subject of wheels and tyres, both road and track, for the 996 and 997 models (meaning 18" & 19" fitments).Thanks Tony! I will research and list as many reliable sources for such information as I can find ASAP. And it might also be an interesting pilot for our first (moderated) discussion section. Stay tuned!